Sun worshippers peeled off in parks and enjoyed surprise sorties to the seaside as yesterday became the hottest September 29 for more than 100 years. The 84f (29c) temperatures seen in parts of the country trumped the Costa del Sol, Turkey and even Mexico. And it smashed the previous record for a balmy September 29, when the mercury hit 81.5f (27.5c) in York in 1895. Another good excuse to show a clip from It Ain’t Half Hot Mum. And I hope our non-UK readers are enjoying some great weather too. David Croft- comedy genius R.I.P. Very sad to hear the news that David Croft, one half of the best comedy writing partnership of all time, has died at the age of 89. Together with Jimmy Perry, Croft wrote three of the all-time classic tv sitcoms- Dad’s Army, It Ain’t Half Hot Mum and Hi-De-Hi. Above, you can watch part one of a classic episode of It Ain’t Half Hot Mum. Enjoy. And thank you very much David for all the laughs. Has tv got too much control over football? You can hear me discussing Sir Alex Ferguson’s comments on the Tony Livesey show on BBC Radio 5 Live, here. The discussion starts at around 7mins into the programme of 26/09/11. It's ten years today since the sad death of Peter Shore. This piece of mine appears over at the Guardian's Comment is Free website. Whoever could have predicted that the Maastricht treaty and the introduction of the euro would lead not to a democratic workers paradise, but to unelected bankers and officials imposing austerity and privatisation on EU member states? Who could have predicted that closer European integration would lead to ever-rising unemployment across the continent and ordinary people effectively being forced to leave their home countries in order to find work elsewhere? Well one man did, and his name was Peter Shore. 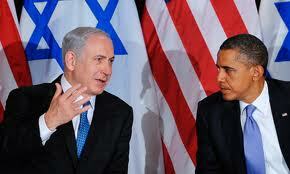 So, the US says that Palestine independence can only come if/when Israel agrees to it. I can’t recall the US saying that Kosovan independence needed to have the approval of Serbia, can you? Why the double standards, Mr Obama? Tony Blair yesterday condemned a ‘deeply confrontational’ move by the Palestinian president to ask the United Nations to recognise an independent state for his people. I wonder if this is the same Tony Blair who was so enthusiastic about Kosovan independence. Ever since the Thatcher governments – which insisted that regulation, rather than being a device to protect the public, was in fact a conspiracy against them– politicians have been deluged with complaints about poor service, mis-selling and excess profit among privatised or deregulated industries. They always promise to get tough and, indeed, sometimes move towards re-regulation. But companies always find new tricks, keeping one step ahead of both consumer and government. So it will continue, for better or worse, until someone dares to utter again the dread words: public ownership. You can read the whole of Peter Wilby’s brilliant Guardian piece on the ‘financialisation of daily life’ in the neoliberal era, here. And of course some of us have uttered the ‘dread words’, and have been doing so for some time. HE was the blunt, plain-talking Northerner whose name will forever be associated with Britain’s most famous horse race – and its best-loved racehorse. Donald “Ginger” McCain, who died two days away from his 81st birthday, was the man who trained the legendary Red Rum to an unprecedented three Grand National victories in the seventies. 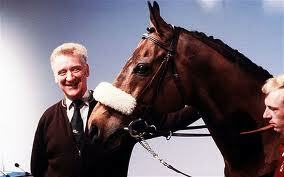 But he wasn’t just a great trainer he was also one of racing’s most colourful and outspoken characters. You can read the whole of my Daily Express piece on the late Ginger McCain here. And you can watch a re-run of the classic 1973 Grand National, in which Red Rum overhauled Crisp in the dying strides, here. Very sad news. Ginger McCain, trainer of the legendary three-times Grand National winner Red Rum has died. Above you can relive the drama of the epic 1973 Grand National when Red Rum overhauled the runaway leader Crisp in the final strides. “It took a special horse to overhaul Crisp in 1973, a very special horse indeed, as we discovered when, 12 months later, Red Rum carried 12st to victory in the National, the knowledge of which, for those close to Crisp, probably makes his anguished and unforgettable defeat a little easier to bear". "Every country I know that has had IMF or World Bank programmes has only impoverished the poor and enriched the rich." You can read the rest of Stuart Jeffries’ Guardian interview with Imran Khan here. 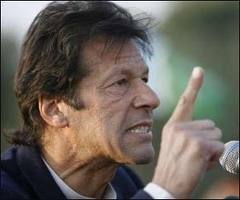 Let’s hope that Imran is successful in his bid to become Pakistan’s President. His analysis is spot-on. 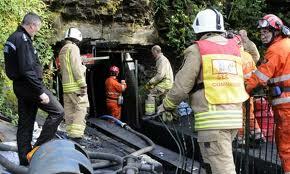 What terrible news about the four miners found dead in a flooded mine near Cilybebyll in South Wales. The National Union of Mineworkers (NUM) is worried that these privately-controlled facilities, which barely employ more than a dozen workers at any one time, operate largely "under the radar" of mine inspectors – if only because they are usually situated on remote hillsides. Chris Kitchen, general secretary of the NUM, said: "We have grave concerns about safety standards in these kinds of mines. We fear that safety is often set at minimum standards so that costs can be kept down. They are not generally unionised or easily visited by inspectors." Neil Clark: In attempting to appear 'moderate' by calling industrial action 'a mistake' at TUC, Miliband has misread the public mood. Of all forms of caution, caution in love is perhaps the most fatal to true happiness, wrote the philosopher Bertrand Russell. Caution in politics can be pretty damn fatal too. We saw a classic example of this phenomenon with Ed Miliband's failure to support public sector strike action at this week's TUC conference. The Labour leader believes this summer's strikes by teachers and civil servants were a "mistake" and the further action announced by unions on Wednesday should not take place while negotiations are ongoing. Sorry, Ed, but the mistake is yours. Transport Minister: Britain's railways have become a "rich man's toy"
Fifteen years of privatised railways and it's come to this. What a surprise. And, make no mistake, our health service will go the same way if we allow them to get away with it. More stories from today's papers on the wonders of neoliberalism here and here. What's it really like to fly a Spitfire? To mark Battle of Britain Day, which is commemorated later this week, here’s my Daily Express piece on the aircraft that played such a key role in the defence of Britain against the Nazis in 1940. IT IS the most famous British fighter aircraft of all time. In 1940 the Spitfire played a crucial role­ in our country’s “finest hour” – our against-the-odds victory against the Luftwaffe in the Battle of Britain. Since then piloting this iconic plane has been a dream for generations of schoolchildren. Now the dream could become a reality. It is clear that the troubled passage of the Health and Social Care Bill reflects real concern over the future direction of the health service in England……. the BMA continues to call for the Bill to be withdrawn or, at the very least, to be subject to further, significant amendment. We believe there continues to be an inappropriate and misguided reliance on "market forces" to shape services. You can read the whole of the letter from Dr Hamish Meldrum, Chairman of Council, BMA, here. While here you can read the excellent Guardian interview with Dr Meldrum. Also, if you haven’t done so already, please pop over to 38 Degrees, to sign their petition and to send a letter/email to your MP ahead of next week’s third reading of Lansley’s appalling Health Bill. Remember, it’s the future of socialised health care that’s at stake. As Seumas Milne says here, we cannot allow the end of the NHS in all but name. This piece of mine, on one of Europe’s most beautiful regions, appears in the Mail on Sunday. If you've never visited Germany's Rhineland, then I heartily recommend it. My wife and I are standing at the top of an enormous 400ft-high rock gazing down at magnificent river scenery. But this is no ordinary rock. According to a 19th century legend, it was the spot where a beautiful siren, Lorelei, who had earlier committed suicide because of an unfaithful lover, lured boatmen to their death by bewitching them with song. We are in the Rhineland, the spectacularly beautiful region of Germany where myths and legends - and fairytale castles - abound. Our visit to the rock was one of the high points, literally and spiritually, of our week-long coach holiday exploring the towns and cities which lie on Europe's great river.